Wednesday, March 30, 2011, 9:30 a.m. and 11:30 a.m. TICKET PRICES : $7. Note: 11:30am performance is SOLD OUT. :: Download study materials for this program. Celebrate Cesar Chavez Day at Montalvo! Bilingual educator, children’s author, and recording artist José-Luis Orozco blends traditional Latin American children’s songs with original compositions to introduce students to Latin American oral traditions and concepts. 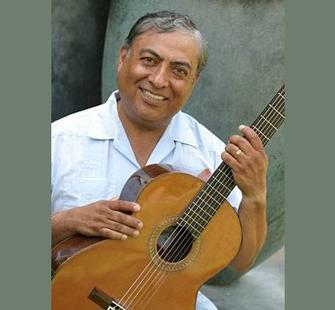 Orozco’s special connection with children emanates from his melodious voice, warmth, and understanding of a child’s developmental stages. Students are sure to love this interactive bilingual concert. José-Luis Orozco's latest book Rin, Rin, Rin...Do, Re, Mi, richly illustrated by Caldecott Medal winner David Diaz, is a delightfully lyrical bilingual (English and Spanish) children's book which shows how everyday family activities such as cooking, singing, reading and storytelling foster essential early literacy skills such as letter recognition and language development.